The concept of the Singularity—the point when machines become so intelligent that humanity can no longer keep up—has captivated many technologists and futurists in Silicon Valley and beyond. The Singularity is so hotly anticipated by these believers that conservative commentator Wesley Smith described it as the "materialist version of the Rapture," where man abandons his body through technology to become immortal. But if this techno equivalent of the Second Coming did occur, how would the world's religions react? Not every Singulatarian agrees on what the exact consequences of the Singularity will be. Some suspect that it could create a sentient artificial intelligence that's smarter than a human. Others suggest that it will allow humans to implant a small computer in the brain that will give them access to infinite knowledge. Some believe that it will be the point where humans figure out how to transfer a mind into the computer. The Catholic Church has issued an official declaration about the Singularity and transhumanism, which is the idea of using technology to achieve the next state of human evolution. In the declaration, the XVIII International Science and Life Congress stated that the movement's tendency to emphasize non-human forms of life has the side effect of devaluing human life in itself. However, most religions haven't taken time to officially deal with the potential existence of the Singularity. As a religion journalist, I believe it's possible to predict how the leaders of the major world faiths might react to the Singularity based on relevant doctrine. The groups most resistant to the idea of the Singularity would likely be the Abrahamic faiths: Christianity, Judaism, and Islam. All of these faiths hold to the idea of an immutable soul; that human beings are unique creatures created by God, that God or Allah has a special place for man in the created world, and that the human soul and body are intertwined. The Singularity would have a particular effect on the Christian and Judaic doctrine of Imago Dei, the idea that man is made in God's image. While many Christians and Jews believe this doctrine to be sacred, they aren't sure what the Imago Dei provides. The most popular theory is that Imago Dei provides man with his ability to imagine and reason. If the Singularity were to create a sentient machine with the ability to reason and imagine, it would give theologians reason to doubt whether man's reasoning ability originates in the Imago Dei. Imago Dei is also why Christian and Islamic scholars are skeptical of whether the Singularity could enhance computers to the point where they can store a human mind. The same could be said about the Islamic doctrine of man, which emphasizes the uniqueness of Adam at the time of his creation in the Garden of Eden. While the Singularity seems to oppose key doctrines in the Abrahamic tradition, there is a small group of believers who are more open to the Singularity than the rest. Over the last ten years, some Christians and Mormons have founded pro-transhumanism groups (such as the Mormon Transhumanist Association or the Christian Transhumanist Association) that believe their faith is compatible with the principles that the Transhumanist Declaration proposes. The Mormon faith is quite compatible with the Singularity, says Mormon Transhumanist Association president Lincoln Cannon, because Mormons believe that they are "progressively being transformed into immortal beings." This transformation comes in two stages: transfiguration and resurrection. The transfiguration gives people a temporary physical and spiritual change that would allow them to exist in God's presence. The resurrection is the full recreation of their bodies in the image of God. Cannon believes that this would include the incorporation of technology (either life-enhancing devices or the transference of consciousness into a machine, or "avatar"). That doesn't mean that technologically enhanced Mormons are perfect. Cannon emphasized that all Mormons will have to go through the process of resurrection, regardless of the condition of their bodies. Christopher Benek, a Presbyterian minister and well-known Christian transhumanist, expressed a similar notion. "I think that the concept of the Singularity forces humans to consider the fact that we are special, not necessarily because we are the most intelligent creatures in God's creation but instead, because we are loved and cherished by God," he told Motherboard. Benek goes on to explain that the Singularity could open up opportunities for people to avoid physical death while they wait for the Second Coming of Christ. While the Abrahamic and Western religions may have some doctrinal issues with the Singularity, Eastern religions may be more open to it. Many prominent Buddhists and Hindus including the Dalai Lama have expressed support for various forms of Singularity-dependent projects. Those include the development of a new kind of human being as well as the 2045 Initiative, a group of transhumanists who are trying to build an artificial body (or "avatar") that could store their consciousness after death. Buddhism's doctrines are perfectly compatible with the Singularity because they don't require a sense of self, Buddhist futurist James Hughes told the Buddhist magazine Tricycle in 2010. "The core idea of anatta (Buddhist perception of 'soul-lessness') is that there is no permanent and abiding or 'authentic' self," he said. "There is only change and your own conscious process of self-creation. The Abrahamic faiths believe in a soul, which is carried into secular ideas of 'authentic self.' 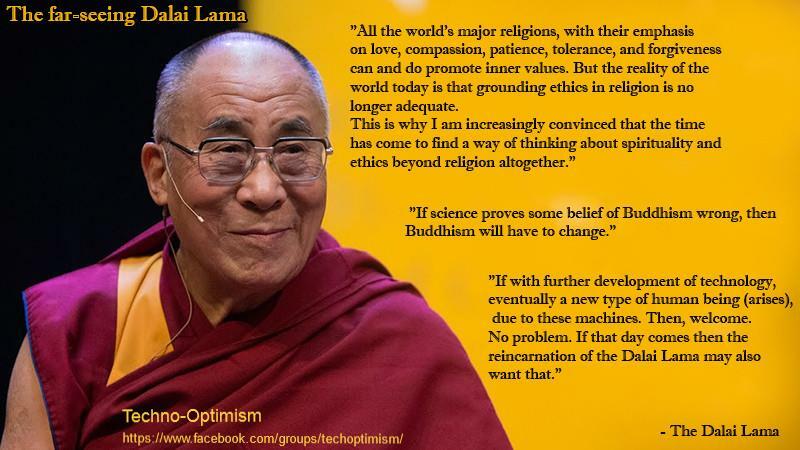 But Buddhism doesn't." Mormons believe that they are "progressively being transformed into immortal beings"
The lack of emphasis on the "soul" therefore allows Buddhist doctrine to more readily accept the implications of a machine becoming sentient, or the transferring of a mind into a computer. The Hindu conception of the soul is similar to the Buddhist conception. Hindus believe in the "Atman," a soul-like element that cannot be accessed or understood by material senses. This soul is condemned to an existence of death, suffering and reincarnation. However, an Atman that "realizes" itself could eventually pass on into the realm of ultimate reality, known as "Brahman." The fact that one's Atman is constantly reincarnated in a variety of bodies wouldn't contradict the Singularity. In fact, such a development would give a devoted Hindu the incentive to transfer his or her mind into a machine, and spend the rest of their lives seeking self-realization. While many leaders in the transhumanist community believe that the Singularity is an undeniable fact, the fact is that most of the evidence scientists have for it is theoretical. The basis for the idea is Moore's Law, which is a fairly accurate portrayal of how computing power has grown over the years. However, Moore's Law doesn't necessitate the results that pro-Singularity leaders believe it does. That's why so many critics compare the Singularity to the Christian notion of the Rapture; they're both doctrines that have a significant effect on how one strives to fulfill one's goals, but are (for the most part) based on evidence that is hotly debated within each community. And just like the Rapture, it's nearly impossible to prove that the Singularity will happen until after it has already happened.